In the Hindi fantasy novels of Chandrakanta vintage, aiyaars were shape-shifting spies who were exerts with disguises, chemicals and medicinal herbs. Which is why the title of Neeraj Pandey’s new film, Aiyaari, made it sound exciting. That it turns out such a dud is disappointing because Pandey has been behind thrillers like A Wednesday, Baby, Special 26 and Naam Shabana. The idea of a covert intelligence unit that will be thrown under a bus if anything goes wrong, has been used in many films, including his own Baby. So is Aiyaari cobbled together from scenes left out of earlier scripts? 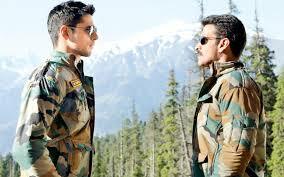 It lacks the cohesion and tautness expected from a film by Pandey. Right off, it displays it sloppiness, when the head of the covert unit, Colonel Abhay Singh (Manoj Bajpayee), goes to Egypt to kill a villain – who? why? not explained—and intends to kill him from the window of his hotel room, not with a sniper’s rifle, but a revolver. And then, incredibly, the bullets are in the hotel safe! So, no matter how well the chase and killing is shot in a busy Cairo market, the sequence is dead on arrival. There are many such glitches scattered through the film, but the biggest flaws are its sluggish pace and incoherence. Abhay’s acolyte Major Jai Bakshi (Sidharth Malhotra), overhears, literally via an electronic fly on the wall (a General’s room is not routinely checked for listening devices!) an arms broker Gurinder (Kumud Mishra) offering the General (Vikram Gokhale) a bribe to pass bogus arms bills. He must have also heard the refusal, but, concluding that the system is corrupt (which is no big secret), he goes rogue. What exactly he means to do with the data he steals from his unit is not clear either, but a fuming Abhay chases him and his hacker girlfriend (Rakul Preet Singh, decorative) to London, from where a mysterious arms dealer Mukesh Kapoor (Adil Hussain) supposedly pulls strings in Delhi. There are needless flashbacks in Kashmir, which add to the film’s 160-minute run time, but nothing to the narrative. Then, apropos of nothing, the whole mess is dumped in Mumbai and the Adarsh scam—which is no spoiler, because it has been revealed in the film’s publicity pieces—and the audience is left wondering about the connection. Bajpayee (always dependable) and Malhotra (always bland) do get to don a couple of disguises each, but that hardly matters. The film just goes all over the place and though some individual scenes are interesting, the whole thing just never adds up. The crucial question the film raises and answers vaguely, is why Indian ex-armymen become weapons dealers! There is a film there, but Aiyaari is not it.